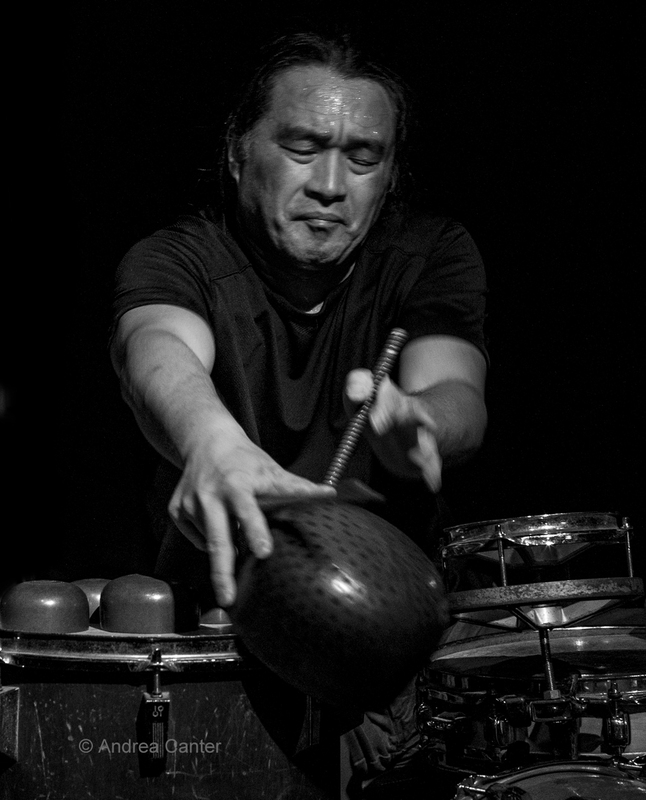 Tatasuya Nakatani is a mystic of percussion. A native of Osaka based in Easton, PA, he’s not only a master of the standard trapset, but a genie who summons other worlds from a formidable arsenal of intended and unintended “instruments” – gongs, cymbals, sticks, mallets, bowls, boxes, bows – pretty much anything one can hold and hit, rub or scrape. My first two encounters with Nakatani were at the Rogue Buddha Gallery in northeast Minneapolis, a long narrow space that easily accommodated a three-sided array of gongs. In solo, Nakatani began at one end and gonged around the perimeter and back, like a thunderstorm that began with a low rumble, reached a peak of intensity in a shower of rain, and receded into mist. 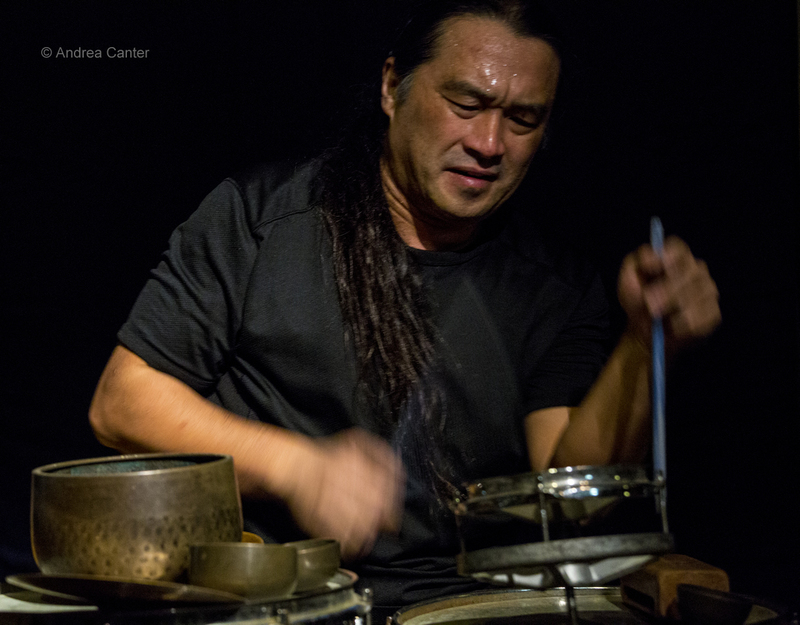 At the Black Dog last week, however, space was limited to the small square stage, and Nakatani similarly limited his playground to one middle-size gong hanging by the trapset, accompanied by a toybox filled with bowls, blocks, cymbals and bows. (He brings along more bows than a concert violinist. And he uses them all.) 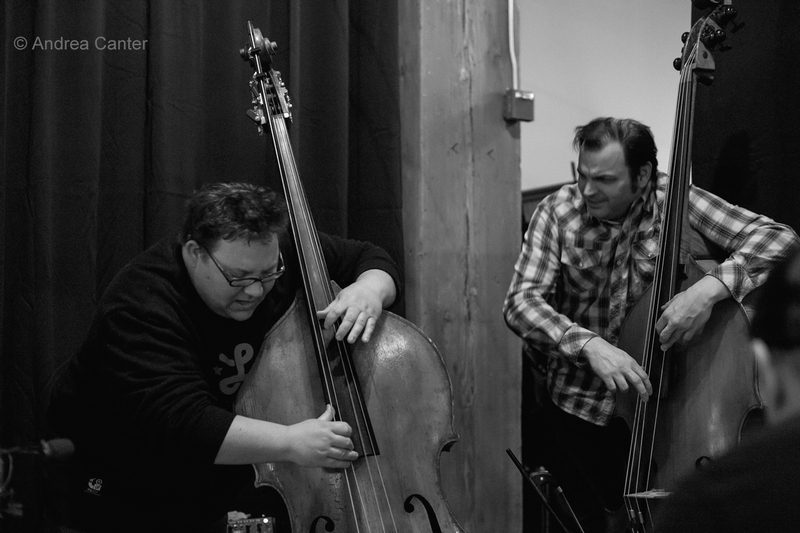 As he had on the earlier gigs, Nakatani played one solo set, turned over the stage (or in this case, the tight adjacent floor space) to the double bass duo of Adam Linz and Chris Bates, and finished the evening in spontaneous trio improvisation. The three musicians are ideally suited to collaboration. 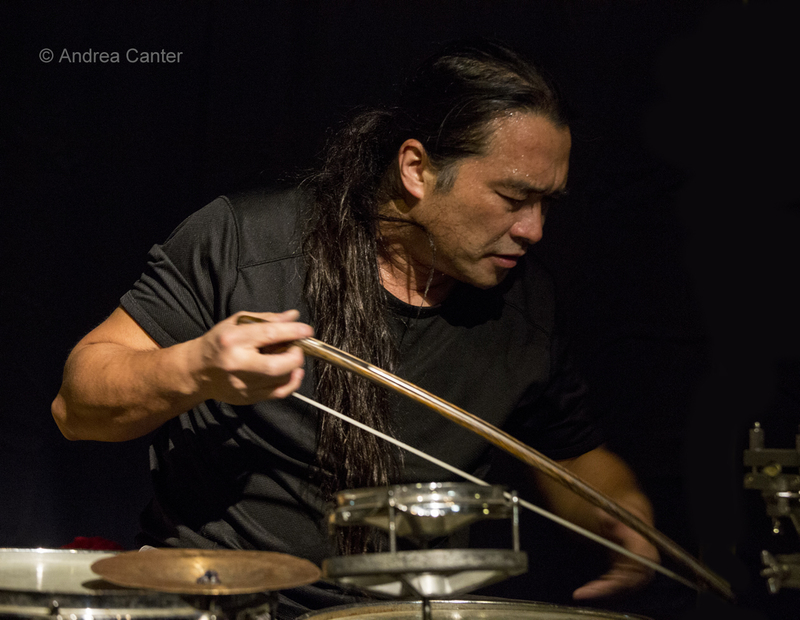 Nakatani uses the bow as a major force in creating soundscapes. Linz and Bates use their hands and bows as percussive forces in augmenting their range of dynamics and rhythms. And none of these artists is confined by convention in any fashion, physically or musically. Yet the result is clearly music, not mere sound. Most fascinating to me is the range of pitches lurking within the thin metal of the gong, as struck by a mallet or set into imperceptible vibration by a bow sliding across its edge. Or the qualitative alterations of the double bass sound when the strings are bowed at the extreme top or bottom of the instrument. Did that bowl really slip away? At one point I marveled at Nakatani’s ability to wreak havoc on a set of metal bowls balancing atop the drum head without dropping any—like a veteran circus juggler. Then suddenly a bowl crashed to the floor. He is human after all. Or was that just one more strategic ploy?